This this is the third sale in a series of Princely States of India auctions. 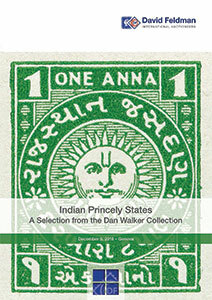 This offering brings to the market more than four hundred lots representing a wonderful array of items from all almost the Princely States of India with unused, used, multiples, varieties and usages on cover. This auction gives the new and old collectors the opportunity to start a new collection or add items to there already advanced holding. It must be said, though, that many collectors have stayed away from collecting India States due to the many forgeries that exist. Nevertheless I can say with all confidence that the items in this sale have been fully check by Dan Walker himself, who is one of the world’s leading experts in this field.